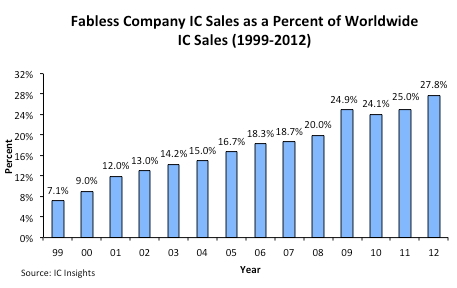 Fabless company IC sales increased more than 3x the rate of the total IC market from 1999-2012. May 2, 2013 -- Unlike the relatively close annual market growth relationship between fabless IC suppliers and foundries, fabless IC company sales growth versus IDM (integrated device manufacturer) IC supplier growth has typically been very different (Figure 1). 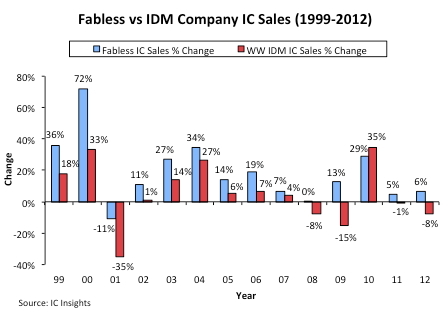 Except for 2010, fabless company IC sales growth has always outpaced IDM IC sales growth (or the decline was less severe). In 2010, for the first and only time on record, IDM IC sales growth (35%) outpaced fabless IC company sales growth (29%). 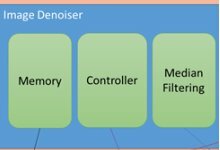 Since very few fabless IC suppliers participate in the memory market, they did not receive a boost from the surging DRAM and NAND flash memory markets in 2010, which grew 75% and 44%, respectively. Another reason for the relatively poor showing by the fabless IC segment in 2010 was that some of the large fabless IC suppliers like MediaTek and ST-Ericsson registered growth that was less than half the total 2010 IC industry average. However, the fabless IC suppliers once again grew faster than the total IC market in 2011 by registering a 5% increase as compared to a 1% decline in sales for the IDM companies. In 2012, the fabless IC suppliers grew by 6%, 14 points better than the 8% decline registered by the IDMs and 10 points better than the 4% decline shown by the total IC market. 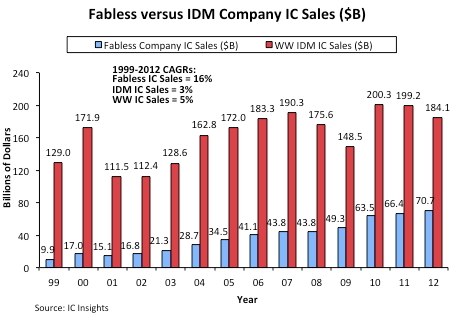 Figure 2 compares fabless-company IC sales to IDM-company IC sales since 1999. As shown, the 1999-2012 worldwide IC market displayed a modest 5% average annual growth rate. In contrast, total IC sales from the fabless IC companies during this same timeframe registered a very strong 16% CAGR, more than 3x the total IC market rate. As a result of this trend, fabless IC company sales increased more than 7x from 1999 to 2012 whereas the total IDM IC market was up less than 50% over this same timeperiod. Moreover, the IDM companies’ IC sales in 2012 were only 7% greater than they were 12 years earlier in 2000 and less than they were five years ago in 2007. Given the big disparity in the 1999-2012 CAGRs between the fabless IC suppliers and the IDMs, it comes as little surprise that, except in 2010, fabless IC companies have been increasing their share of the total IC market (Figure 3). As shown, in 1999, fabless IC company sales accounted for just over 7% of the total IC market. However, in 2012, fabless IC suppliers represented 27.8% of worldwide IC sales, a new record high. 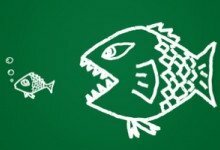 IC Insights forecasts that, in 2017, fabless IC companies will command at least one-third (33%) of the total IC market, especially if more large companies like IDT, LSI, Agere, and AMD become fabless over the next five years. 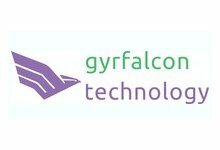 Over the long-term, IC Insights believes that fabless IC suppliers, and the IC foundries that serve them, will continue to become a stronger force in the total IC industry. 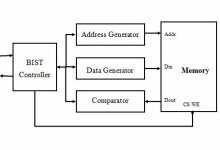 Data in this research bulletin was excerpted from the April Update to the 2013 edition of IC Insights’ flagship report, The McClean Report—A Complete Analysis and Forecast of the Integrated Circuit Industry, which features more than 400 tables and graphs in the main report alone. A subscription to The McClean Report includes free monthly updates from March through November (including a 250+ page Mid-Year Report), and free access to subscriber-only webinars throughout the year. An individual-user subscription to the 2013 edition of The McClean Report is priced at $3,390 and includes an Internet access password. 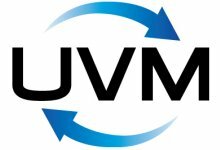 A multi-user worldwide corporate license is available for $6,390. 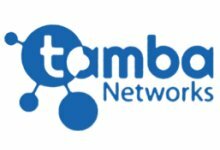 Pure-Play Foundry Market Surges 11% in 2016 to Reach $50 Billion!